Yesterday evening was the "cut and @#!" time for the invisiballs. I was not in top shape, or I was too much distracted by the film on tv, or both. In the afternoon I tried the shape of the tree with the plastic coated wire and it was a failure too. I changed my mind and have another idea for the tree. I think to use a plastic transparent sheet, shaped in a cone. It must be at least 30centimeters high. What do you think? 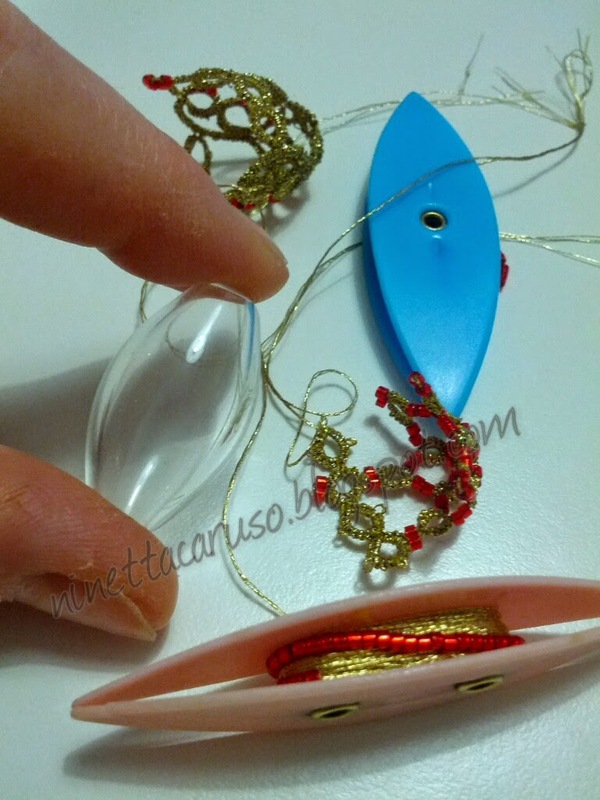 the cone shape sounds like a good idea, would you remove the cone after shaping the tatting? I am curious about the bauble you are using in the picture, I not sure I can get one of those in our craft stores. Thank you for the comment. All baubles are made of glass and I found it last summer in a market stall. Good idea, then your tatting would look as though it were floating. Lol Jane! I think I'll do what I can, not what I wish I did!